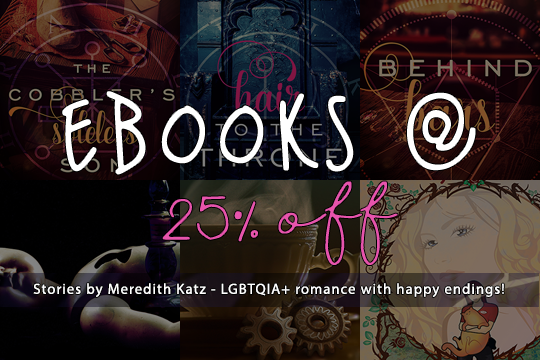 My awesome publisher, Less Than Three Press, is having an end of summer sale from Sept 1-8 where all ebooks are 25% off, with preorders an additional 15% off! That’s so much sale. I’d love if you checked out some of my books below, but if nothing of mine strikes your fancy, please still check out some of the amazing new reads from other fantastic LT3 authors, because I certainly will be! So what books have I written? Beauty and Cruelty ($5.24) – “What if god was one of us?” Except more like, “what if fairy tale archetypes were one of us?” The Evil Fairy is working at a coffee shop to make ends meet, getting by in the true millennial book-hoarding way. The archetypes are fading away into obscurity… until Sleeping Beauty decides it’s time they all saved themselves. Fairy tale endings? In this economy?? Winner of Rainbow Awards 2016 – Best Lesbian Debut Book! The Cybernetic Tea Shop ($2.24) – Drifting, quiet, and calm. A robot running a tea shop meets a wandering mechanic. A short novella about love and learning when to let go. Empty Vessels ($4.46) PREORDER – A young man that sees monsters, the ghost that keeps him company, and the weird and haunted world of Others that Keith finds he needs to help protect. Possessed dolls, faceless ghosts, bone girls and horned boys, and things that go bump in the night. Some kingdoms are ruled by demons. Some are ruled by humans. And in others, demons and humans coexist. In all cases, there’s a lot that can go wrong. This series can be read in order or as standalones! They’re loosely interconnected in the same fantasy world with some characters reappearing in each. The Cobbler’s Soleless Son ($1.49) – A rowdy adult fairy tale adventure following the valiant attempts of Renart, the cobbler’s son, to outwit and trick his way into a Demon Prince’s bed. The game’s afoot! Behind Bars ($3.74) – Pel is part of his human-only city’s brutal anti-demon inquisition. His son, unfortunately, doesn’t share his opinions. And while Pel just wants to keep his human son safe from demons, when a stranger comes to town, Pel might end up needing a demon to help keep his son safe from humans. Hair to the Throne ($2.24) – Merle is not expecting a good time when she’s kidnapped to the depths of Demon Prince Vehr’s castle, but instead she finds her long-lost best friend. So what’s Merle to do except try to make a new life with the prettiest girl she’s ever seen? Problem: demons. Only Human, in Less Than Dead – Saul comes down with a magical malady, which is really depressing until he meets his new doctor’s secretary, Theo—who is super hot, just also, super dead. Debating the Dragon, in To the Victor – Lady knight May intends to slay a dragon and rescue a princess, but why do you have to fight the dragon? Can’t you sometimes just talk to the dragon? Maybe kiss the dragon? You can reblog my tumblr post (I’d love if you did!) or check out the main LT3 post here to help us get the word out! Happy reading and happy Autumn! For my most frequent updates, follow me on Twitter: @MeredithAKatz !